• Easier to peel and faster to apply with the unique QuickPEEL feature. • Guaranteed Jam Free with outstanding print quality. • Suitable for laser printers. • Eco friendly labels, can be recycled as part of paper waste. • FSC certified - made with paper from well managed forests. • Save time with free Avery® templates and software for Microsoft® Office. 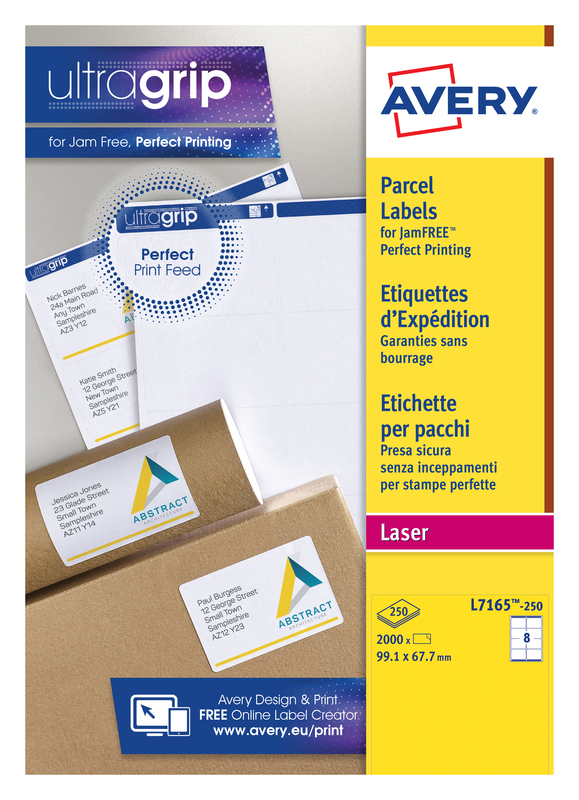 For use with your laser printer, these Avery parcel labels feature jam free printing for reliable results every time. The opaque design completely covers old labels, which is ideal for re-using boxes, parcels and envelopes. Each label measures 99.1 x 67.7mm. This pack contains 250 A4 sheets, with 8 labels per sheet (2000 labels in total).